JoeCustoms and the JoeCustoms crew will be on hand to display the incredible customs produced by our talented members, as well as provide tips and tricks to take your customers to the next level. There will be an area to work on your own custom figure, and a contest or two! Assembly Required is one of the premiere regional GI Joe shows in the country, providing all the fun and excitement of Joecon but at a fraction of the price. Celebrating it's eighth year, this year's Assembly Required will be held on Saturday, November 10th in Des Moines, Iowa, from 10 AM to 5:00 PM. I will post updates here, meanwhile, if you have any questions I will be happy to answer them for you. See you there! Ron was one of the artists on the original Marvel GI Joe run. He did the art for issues 63-68, 70-74, 76, 80, 82-86, 100, and 115, as well as many covers for GI Joe: Special Missions and GI Joe Yearbook #3. He is a very approachable artist, and often takes commissions at the show. AR is a great place to meet with him without all of the usual crowds associated with bigger shows. 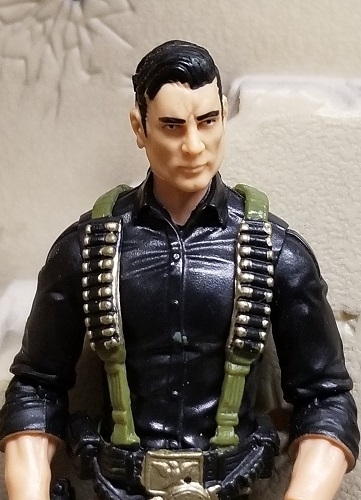 Once again this year the Joe Declassified crew will be bringing their usual assortment of GI Joe prototypes, designs, and rarities to display, as well as a presentation that will reveal even more unique and unusual items of Joe lore. Their display was always a highlight of Joecon, and with that now a thing of the past, this is one of a handful of chances you'll get to see pieces of Joe history in person! One of the main attractions of Joecon was looking through all of the vendors’ stock, searching for that Holy Grail you have been chasing. Assembly Required features many of the vendors who were regulars at Joecon, plus a few new ones. Vintage and modern GI Joe figures and vehicles will be for sale, and it’s another reason AR is a can’t-miss Joe show! Ps- If you want to set up as a vendor at AR, there are still a couple of tables open, pm me and I will get you the info! Assembly Required has many contests and giveaways to enhance your experience. There will be custom contests with three different categories: Figures (All sizes), Vehicles/Dioramas, and Kid's Customs. Bring that project you have been working on and show it off! In addition to the customs contests, there will be raffles three times during the show for your chance to win fantastic Joe-related prizes, with a grand prize drawing at the end of the day (I can't say what it is, but THEY'RE GREAT!) No purchase is necessary for the grand prize drawing, but you do need to be present to win. There will also be other contests and giveaways that will be presented by Joecustoms and other vendors, it's worth your time to check it out. Assembly Required has been held in Des Moines since it's inception in 2011. If you've never been to Des Moines, it may surprise you. Des Moines is not a town full of cornfields and cows, it's one of the most vibrant cities in the Midwest, full of things to do and see. It is easily accessible from almost anywhere in the US, and is located at the intersection of I-80 and I-35. Still upset that all the Toys R Us stores closed down? Wish you could still go to a store and just browse aisle after aisle of toys? Well, Des Moines has the place for you! Jay's CD & Hobby has one of the largest selections of toys, comics, games, and more in the Midwest. If you are looking for something, chances are Jay's has it. There are two locations, each with their own unique inventory. It's well worth a trip. Like to eat? Des Moines has that covered! Des Moines has an eclectic collections of restaurants, everything from pizza with a Chinese twist (Fong's Pizza) to burgers with an undead flair (Zombie Burger). Like to drink? Oh wait, I forget the crowd I was talking to, of course you do! Well, Des Moines has the covered too! We have an outstanding selcetion of world famous Beer Bars for you to sample. Some have up to 262 beers on tap for you to try, but I would not recommend trying them all at one sitting. If you come to Des Moines for Assembly Required, you will not be sorry. Reason #7: Cartoons and Cereal! One of the best parts of childhood was waking up on Saturday morning and getting a big bowl of cereal as you sit down to watch cartoons. For many of us this was a ritual that played out for years, and were some of the best times we had growing up. Well, as Assembly Required this year you can relive those bygone days with a morning of cereal and cartoons! From 9:00-10:00 on Saturday, November 10th, there will be bowls of cereal and select episodes of GI Joe: A Real American Hero to enjoy before Assembly Required kicks off at 10:00. The AR staff will provide the cereal and cartoons, so get up early and join us! Last edited by Joeczar on Fri Oct 19, 2018 7:17 am, edited 2 times in total. Bowls of cereal you say? GAME ON! New this year is a Dinner the night before Assembly Required on Friday, November 9. In previous years staff, vendors, and attendees would meet up at a restaurant to catch up and talk all things Joe. This was often done without reservations, and with it being on Friday night, often lead to long waits for tables and people being spread out. This year, we will have our own area to eat and mingle! Seating is limited to 50, and if you are interested in attending you can Paypal the $25 to Brian@saturdaymfg.com by Sunday, October 21st. I'm so stoked for this!! Assembly Required did not forget that GI Joe is also for kids! Kids attending AR will get a chance to go on a recon mission for a chance at acquiring a case full of top secret GI Joe goodies, all for free! It's a great chance to get the next generation of GI Joe collectors in on all of the free fun at Assembly Required! Wait - people are bringing their kids? Is that a personal choice or more of a count mandated minimum distance sort of situation? Assembly Required is one of those rare chances to meet up with all of your friends from Joecustoms and other GI Joe sites. With no more Joecons the opportunities to meet like this are few and far between. It's not just AR itself, the Friday Night Dinner, visiting Jay's CD & Hobby, and the unofficial after show in the hotel lobby are all chances to get to know your fellow collectors/customizers a little bit better. I heard drbindy and jm70 might be playing cards one night in the lobby.